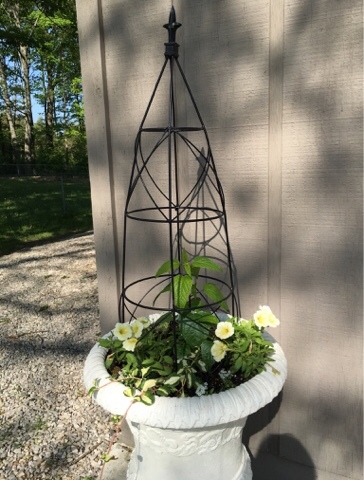 Early this spring I found these topiary metal forms at the garden center and put them in my tall planters out front of the garage. 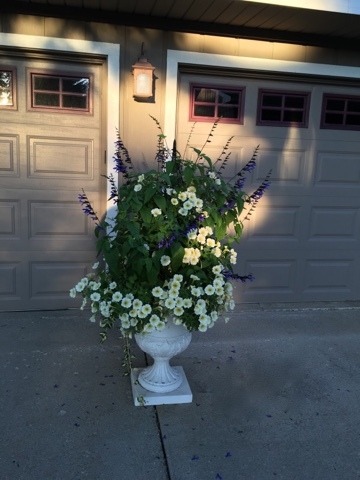 The primary reason was to help support the "Black and Blue" Salvia (or sage) plants that I put in the planters. The plant gets very tall and tends to flop over. The hummingbirds and bees absolutely love the plant. I plant things that attract the hummers rather than put out a feeder. This picture was later in the summer after it really filled out. 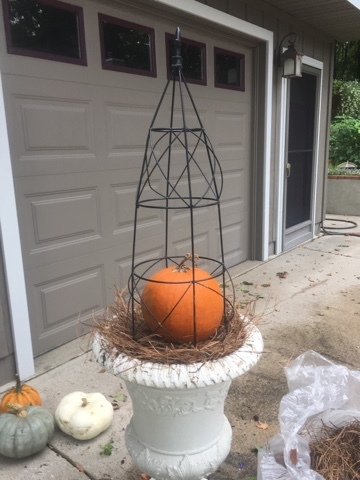 My 2nd use was with this pumpkin stack I created for the inside of the topiary form for the fall season. A few days ago I discovered the pumpkins were started showing signs of rotting so I had to take them apart before they were mush. For my 3rd use I got an idea to create a look for the holidays by adding garland to the outside of the topiary frames. 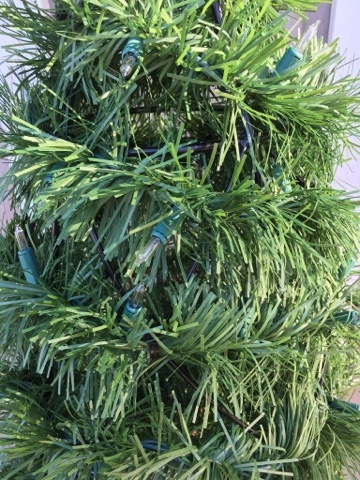 I did have some challenges making the garland fit on nicely because of the square and round shape of this wire frame. Dan and I did some measuring and decided I was going to need needed 12 ft. to go around each form nicely. I kept finding things that were 6 ft. long and pricey. 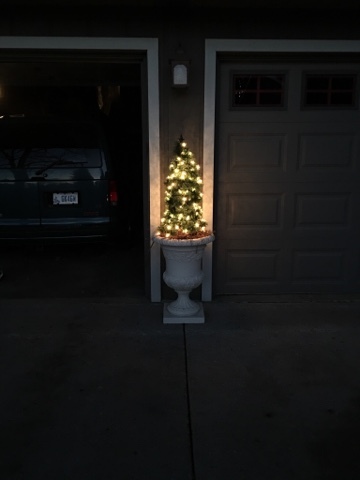 I wanted to do this very inexpensively and when I saw this pre-lit 12 ft. garland I decided it was the way I was going to go with this. I got mine at a place called Menards which is a lot like Home Depot and Lowe's. I saw them at Michael's for $16.99 each so I was pleased to find them at this price. They are made by GE and do come in colors too. I spent $10.99 each, and as it turned out two garlands for each form looked best so I ended up doubling my initial investment but it was still relatively low priced). Once the wintry weather arrives the snow will cause the garland to want to slide down so I had to secure it in various place with tie wraps. I kept the pine needle straw that was already there to fill in at the bottom. 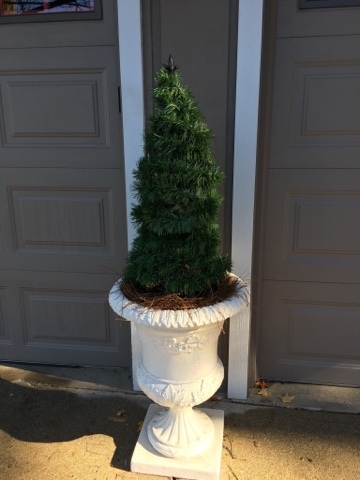 I looked at tree forms with planter bases at Lowe's and they were $89 and up. I plugged it in to see how it looks at night. Though it's not perfect I'm pleased with it. 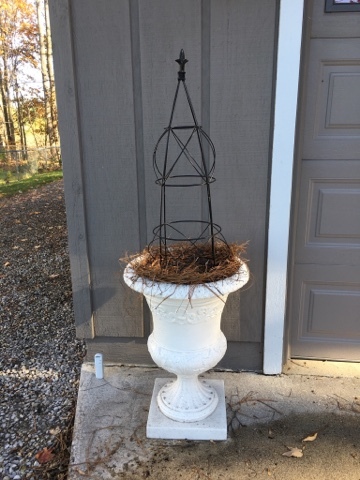 I won't be lighting them up until Thanksgiving but I decided to get this done now since our weather will get much colder and wetter soon. Liz- brilliant! You are soooooo getting your money's worth on those wire forms! 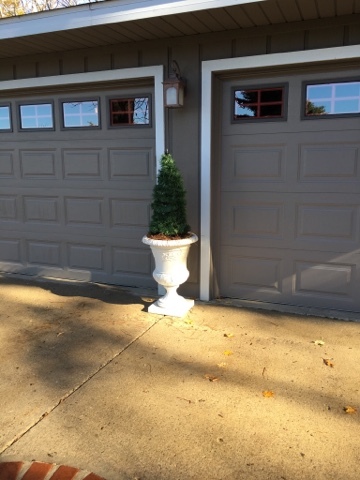 WELL planned, and you now have a wonderful 4 season look with your awesome topiary urns! Oh wow, I love how you change them all the time. Fantastic. I have some of those forms and I want to try the Christmas tree version. Great idea Liz. Great job Liz. Your topiaries are always pretty and cost less than buying something. Love how you can change them out. Hi Liz, I showed your stacked pumpkins to my sister and she is going to copy yours but substitute stacked xmas packages for the pumpkins. 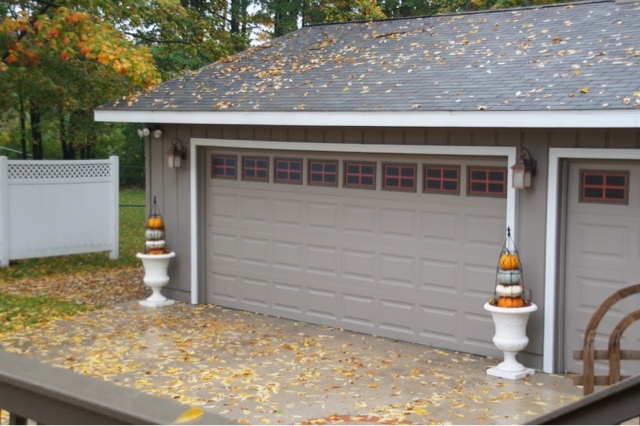 Such a cute idea and the forms will help keep things from blowing around on windy days. Thanks!! How imaginative and creative your Christmas topiaries are, Liz! The garland so beautifully doubled as a mini tree, then lit, is very pretty. Third time's a charm, right?